The following list is of the top 50 breeds of dogs for 2015. The three columns offer a snapshot of each breed's popularity over the past 3 years. While the Labrador remains number (and has for many years), the beagle and bulldog are arguing ovr 4th or 5th position. 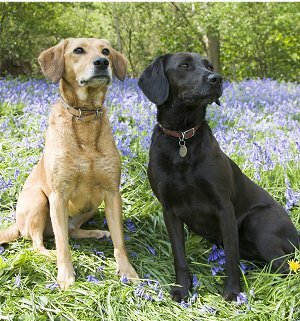 Each of the breeds listed is linked backed to that breed's Standard which can be accessed by clicking on the breed name. The picture and information about the breed will come up in a new window. The Breed Standard is actually a blueprint for the perfect specimen of the breed. It has been developed by the actual breeders who specialize in breeding that particular type of dog, and those breeders and (dog show judges) use it to evaluate how closely any individual animal comes to the description of the perfect specimen of the breed. You will find in the Standard of the Breed clear and precise descriptions of what makes the dog good and what attributes might disqualify the dog from showing (and, possibly, from breeding).